Terre Britton, owner of Terrabyte Graphics, is embracing her third decade in the design industry as an illustrator, graphic designer, writer, and fine artist. She holds a degree in History in Art with a minor in English and has written art reviews for Regional News and Victoria News, Victoria BC. Britton has won Best of Show at Artel Gallery, Pensacola, FL, where she also held a solo painting exhibition and her work, Gala One, was added to the prestigious Cinco Banderas Permanent Collection. Britton, with her husband Daniel Ward, is also co-author of the sci-fi series The Four Orders of Inherent Freedom. The first book, Energetics: The First Order, is expected to be back on shelves in the fall of 2017. 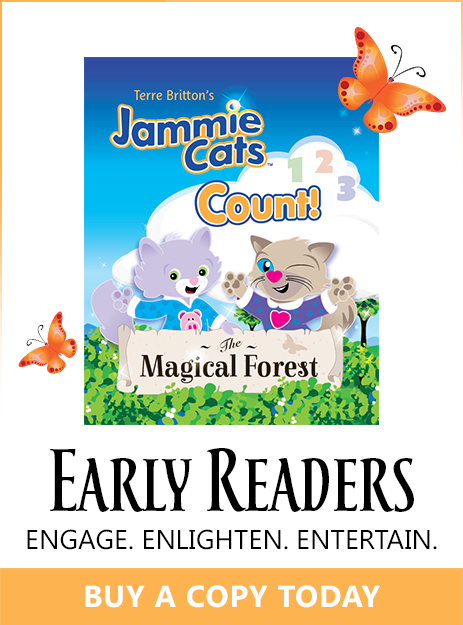 Jammie Cats™Count! The Magical Forest is Britton’s first children’s book and is now available on Amazon and Barnes & Noble. Click here to visit the Jammie Cats™ website.